These financial laws of happiness are drawn from extensive research for the book "You Can Retire Sooner Than You Think". A few of these laws might surprise you, but according to the survey data, living by these eight "laws" makes a lot of retirees very happy. The happiest retirees ditched the BMW and stuck to the Asian Brands. Be sure to put these other “unhappy” cars on your list to ditch: Chrysler, Dodge, Kia, and Mercury. Lexus topped the list for "happy" cars. Once you’re retired and have some extra time on your hands it’s pretty tempting to take a second career as a stock trader. But doing this will only make you unhappy in the end. Avoid changing your investment approach on a whim, and understand the dangers of chasing “hot” investment themes. Find a cause you are passionate about and contribute either money or time. Remember, a happy retirement isn’t just about how much you have, but what you do with it. Make your money count. Happy retirees have a plan for their money whether that means using it to travel the world or giving it away. A lot of people figure that once they retire they’ll have both the money and the time on their hands to move or renovate, but this can lead you squarely in the unhappy retiree camp. Both moving and renovating can come with a massive financial outlay that will only cause stress. If you get the itch to make some changes, it’s best to move or renovate before you stop working. The survey showed that unhappy retirees are prone to making big purchases at precisely the wrong times. Happy retirees have a much healthier relationship to spending. It’s not that they don’t spend money, it’s just that they know when to do it: when they’re still working. 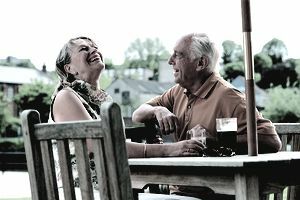 44 percent of the unhappy retiree group reported that they were “Not Satisfied” with the amount of retirement planning they had done, compared to only 3 percent of the happy group. The happy retirees had done their homework and now they’re enjoying their retirement because they planned to enjoy it. You may be asking yourself, “What’s the rich ratio?” The rich ratio is an easy formula that will help you understand your money. It’s simply the amount of money you have in relation to the amount of money you need. Happy retirees have a rich ratio that is over 1. Here’s how you find your own rich ratio: take the income you have coming in every month (social security, pension, investment income, etc. ), and divide it by the amount of your monthly need. Today’s retirement landscape doesn’t necessarily look very good. No one believes he or she will actually be able to retire early, and some people don’t think that they’ll ever be able to retire. What I say to that is, “throw out the pessimism!” Pessimism and be costly and fear is almost always financially devastating. Despite the road bumps, the stock market and economy will flourish over time.